I went to see John Patrick Shanley's Doubt at the American Stage in St. Pete last night. Doubt took Broadway by storm and won the 2005 Tony for Best Play, the Pulitzer for Drama and the Drama Desk Award. I was in New York in 2005 and I couldn't get a ticket to see it. It was frustrating, but what can you do? I knew it would trickle down to the regional theaters eventually. I'm a big booster of our professional theater in St. Pete and I knew that they'd not only do the show, but that they'd do a great job with it. 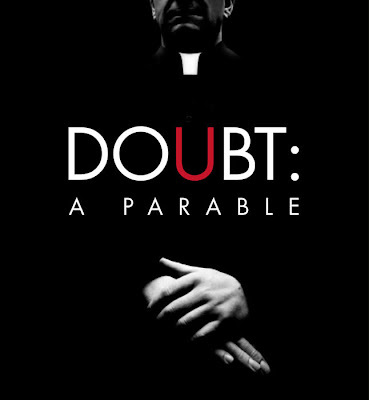 Starting in 2009, Doubt started working its way into regional Equity theaters and my beloved American Stage included it as the last play in its 2008-09 season. Wow. What a masterpiece. John Patrick Shanley deserves every ounce of praise that's been heaped onto his work. If you live anywhere near an Equity playhouse and they're mounting a production of Doubt, drop what you're doing and go see it. 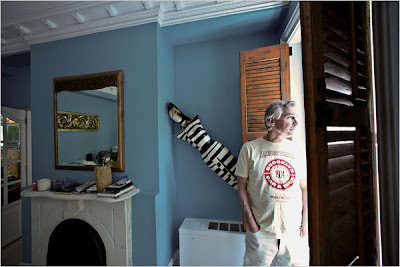 Well, in a great example of coincidence, the New York Times ran a profile of John Patrick Shanley yesterday and talked to him about his quirky and colorful Manhattan apartment. Gramercy Park never looked so good. I love this man's work and I love his eye. 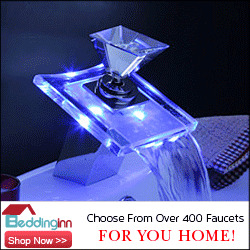 What do you make of some of these rooms? No way!! That dining room table and chairs is EXACTLY what I'm looking for for our place! Gene and I were at the Conestoga Historical Society's museum and they had one of those tavern chairs in a display. I knew immediately when I saw it that it would look perfect with the barn board table. It's fantastic. It sort of reminds me of a Tube station in London.